Much of the historical information about R.S. Prussia in antique publications prior to 1994 is incorrect. Although not known until long after the fact, a detailed history of the ownership and economic fortunes of the Reinhold Schlegelmilch Porcelain Factory was described in Brend Hartwich's 1984 thesis. Information in his thesis was not available in America until the translation was published in 1993 (Int'l Society R.S. Prussia Collectors, Inc). Perhaps the best discussion of the inaccuracies concerning Reinhold's porcelain factory can be found in the first part of Capers Notes on the Marks of Prussia, (Alphabet Printing Inc., 1996). For a long time, it was thought that Reinhold and Erdmann were brothers who jointly owned or ran the factory at Suhl, Germany. In actual fact, there were two factories in Suhl, Erdmann's and Reinhold's. Contrary to folklore, these two operations were in direct competition with each other. Reinhold's factory was founded and initially owned by Reinhold, and subsequently with his two sons, Ehrhard and Arnold. Arnold took over an existing porcelain factory in Tillowitz in 1894, and continued to run it as part of the Reinhold Schlegelmilch enterprise until he died in 1934. Erdmann's factory, in contrast, was founded and originally owned by Leonhard Schlegelmilch. Later on, Oscar, Julius Martin, and Carl Schlegelmilch had a hand in owning and/or running the factory. Oscar Schlegelmilch eventually started his own factory in Langenwiesen, and Julius eventually (1899) took over the ownership of Erdmann's Suhl operation. The historical research by Ron Capers shows there was no blood relationship between Leonhard and Reinhold Schlegelmilch. From the time of founding up to 1892, it appears that little porcelain was exported to America from Reinhold's factory. At the present time, we know for sure what just a few of these early products look like. Objects in several mold patterns used between 1889 and 1892 are known to be marked with the RS "Arrow" mark. Unfortunately, "Arrow" marked objects do not appear in any of the 1892-93 catalogs we have accessed. This may explain the small degree of overlap of "Arrow" marked mold and transfer patterns with other marked examples in the RS continuum of products from later years. Beginning 1893, US wholesale firms began to import larger quantities of china tableware from Europe, and almost all was from Reinhold's factory. Two events in 1894 appeared to have a significant on Reinhold's production. First, the second factory in Tillowitz, (Upper Silesia) began to make far less expensive porcelain than the one in Suhl, owing to the closer proximity of raw materials, and the abundance of cheap labor. Second, the very high US import tariff on decorated porcelain was substantially lowered by the Tariff Act of 1894. 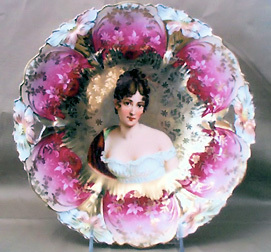 Based on the number and type of entries in American wholesale catalogs, the tariff reduction opened the door to a flood of European porcelain. Overall, most of the tableware (as opposed to dinnerware) came from Reinhold's two factories. To date, we have not been able to find any china tableware from Erdmann's factory in wholesale catalogs issued before 1902. We estimate that between 1895 and 1900, R. S. Prussia exports to U.S. wholesale firms increased between five and ten fold. It was during this time that the R. S. "Wing" trademark was used. The run of good fortune continued through 1903-05, partly due to the growing popularity of the Art Nouveau movement, and partly to the continued updating of the mold and decorating patterns. Reinhold's firm was noted for innovations in the manufacture and decoration of porcelain. Two patents were issued in the United States. One for a clock case was assigned to George Borgfeldt of New York in 1894. Clocks made according to this patent were sold up to the turn of the century. While a round, beveled "patent" mirror was used in many different molds for shaving mugs, we have yet to find records that a patent was actually issued. The conversion to quality decalcomanias (decals) for decoration beginning 1900 produced goods with more color and eye appeal. This may have been the key that opened the door to greater sales. Throughout the years, there was a continued improvement in the manufacturing facilities. Hartwich details many of the modifications made to improve both the quantity and quality of porcelain that the firm could produce. Reinhold's products from the 1900-1905 period were noted as being among the best to be made in Europe. Unfortunately, public taste began to change about 1905. The complex mold patterns stocked by American wholesale firms began to be replaced by china in simple shapes. 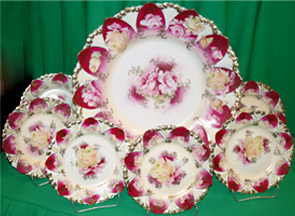 At the same time, imports of inexpensive Japanese china increased. All these factors contributed to year to year decline in the amount of R. S. Prussia carried by wholesale firms. By 1910, simple shapes predominate in all catalogs, wholesale and retail, and Reinhold's products were largely replaced by china from both Japan and other European firms. Reinhold's products made after 1910 are frequently referred to as R. S. Germany, owing to a change in trademark. However, the change in the country of origin is only one of several to have been made between 1895 and 1910. Consequently, we consider the products made from 1910 to the beginning of WWI to be R. S. Prussia, for both manufacturing plants were still in operation. When the hostilities of WWI began in earnest, the Suhl factory was effectively shut down, owing to a lack of skilled labor. Most likely, some talented factory workers were relocated to Tillowitz. The manufacture of porcelain in Tillowitz continued through WWII. Although the plant survived undamaged, much of the equipment used to make porcelain was removed upon Russian occupation. Today, the factory still stands, but the major product is china dinnerware. We need to note at this time how most of the R. S. Prussia was sold in this country, at least during the 1892-1910 period. During January and February, Reinhold shipped factory samples to wholesale firms, and most likely, to factory representatives as well. Orders based on these samples were taken and placed with the factory during the first part of the year. In this way, the firm knew before mid-year just how much china had to be made and subsequently shipped overseas. Manufacturing likely started upon receipt of an order, but delivery was probably timed to arrive at wholesale firms in late September or early October. In this way, merchandise could be in the hands of retail accounts by the Holiday selling season. Most wholesale firms issuing catalogs throughout the year show large sections of imported china only in their September through November issues. In catalog after catalog, we note that imported china was promoted as giftware for Thanksgiving, Christmas and the New Year holidays. The sampling, ordering, manufacturing, and shipping cycle was a continuous, year round process. This had several consequences for Reinhold's firm. First, samples could be made from October to the following January without impacting any of the manufacturing activities. Second, if orders were not placed for items in the sample merchandise, then no more were made. The import of salable samples may explain why collectors occasionally find an object with a unique decoration. Third, Reinhold's firm knew exactly how much china had to be produced by any given date. For this reason, the firm would not have made a "surplus" of unfinished goods. Although some unpainted porcelain was furnished to other European decorating firms (eg. Helena Wolfsohn), examples of their finished products are almost unknown in this country. While white ware could have been exported to American firms supplying china blanks for home decoration, there is no evidence to suggest this took place. Our review of catalogs from firms selling into the home decorating market prior to WWI indicates that undecorated blanks primarily came from Austria and Bavaria. The sale of an excess of Reinhold's undecorated blanks has been proposed to explain some of the trade names to be found on R. S. Prussia blanks. At present, there is no evidence to support this view. The first gathering of R.S. Prussia Collectors was held in Indianapolis, Indiana, in 1985. Bob and Mary McCaslin put an ad in the Antique Trader asking collectors interested in forming a club to join them in Indy for a weekend convention. Twenty families were represented from 12 states. Temporary officers were elected until 1986, when the International Association of R.S. Prussia Collectors formed. The families of the International Association of R.S. Prussia Collectors invite you to join our organization. Members are confident that you will enjoy the friendly atmosphere of the organization and our conventions. Members truly enjoy the beauty and rarity of the R.S. Prussia porcelain. 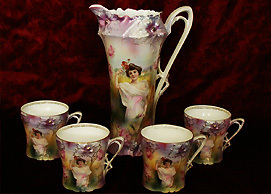 The various designs, colors, and scenes make the collecting of R.S. Prussia a lifelong pasttime. There are members throughout the United States, Canada, and New Zealand who share the enjoyment of collecting this fine porcelain and frequently write and visit each other to keep in touch with the Prussia families.